Wow. So I received this novel in the post from Bloomsbury publishing a couple of days ago, and as soon as I read the blurb, I was hooked! I'm a sucker for novels that delve into topics that are quite contraversial, so I was really excited to pick this up - hence why it immediately shot to the top of my TBR pile. However, whilst I definitely enjoyed the book, I can't help but feel a bit disappointed. But read the rest to find out why. To briefly sum it up, the main character, West, has a biking accident, and is sent, paralyzed and in a coma, to a hospital to recover. Since the story is from his point of view, the reader moves through the story alongside him - catching glimpses of conversation here and there, feeling the slightly numbed touch of injections, and just feeling completely disorientated. But then West meets Olivia - the mysterious resident who is in the room next to him. Over time, their friendship develops, and they come to rely heavily on one another. But Olivia isn't all that she seems. Now I think that the whole concept of this novel is amazing. At first, I thought it would be a bit like Forman's If I Stay - about someone choosing between life and death. But this was different - it wasn't just about that choice, but it was about how your perspective on life changes when you go through something as traumatic as this. It celebrated the idea of friendship, and how you can come to find love in the strangest of places. The characterisation was also great. Personally, although it was all told from West's perspective, and we got to know a lot about Olivia, I still didn't feel like, as the reader, we could penetrate and get under their skin. There was a barrier between me and getting to know them, and although every character had their individual personalities and backstories, I just felt that something was missing. There was a spark that just wasn't there, which was a bit disappointing. I think it could have been improved if we had learned more about their past, especially Olivia. 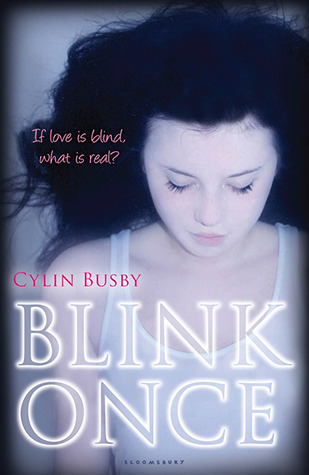 In the author interview at the back of the novel, Busby says that although this was told from West's point of view, she felt it was Olivia's story. In some ways I can see that, especially towards the end. But I would have liked to know more about her. I think that was the only thing that did disappoint me, really. Aside from that, the novel was well-written, easy to read, and actually pretty powerful.It was very realistic, and nothing was sugar-coated, which I liked.If you love novels like Entangled and If I Stay, you should definitely pick this up. Although maybe my review isn't the best, Blink Once had received a lot of five-star ratings - so even though it didn't totally settle with me, it might be the best book in the world to you. It's definitely worth a read.